Flight of Blue starts on the last normal Friday of Kai Williams life. All he has in mind as he waits for the clock to tick by the last few minutes of the school day is a hike he planned with his best friend, Ellie. But before they even get home from school, their whole world is turned upside down by the discovery of an injured Opossum sorcerer on the side of the road. They come to the Opossum’s aid and find themselves thrust into a battle where the Realm of Darkness is trying to push its way into the Realm they live in, and Kai discoveries he’s been born into a role that could prove pivotal in the struggle against Darkness, but he’s not sure he wants to accept it. In the synopsis of the book on Goodreads, there is a possum sorcerer mentioned. I’m from the South, so possums usually get a bum wrap. I’m curious as to how a magical possum wandered into your imagination – would you mind sharing the story? I was driving home one day, about to cross an intersection with a new traffic light close to my house. Fortunately, I wasn't in a hurry, and I didn't start up right away when the light turned green because just as I took my foot off the brake, a car blew through the light like it wasn't even there. Shaken, I continued home, passing a possum on the side of the road that had been hit by a car. Angered by the carelessness of drivers, especially as I'd had my then infant son in the car with me, I got out to see if I could help the poor creature. He was beyond help, but with his dying breath, he told me of an Opossum sorcerer, a cursed traffic light, and a rip in the fabric of the world. Of course, after that I had to investigate and record the story I discovered. What are a few things that make Kai and Ellie special characters? Are there any individuals in particular that you based them upon? Kai is a bit of a reluctant hero, but he values friendship so much that he’s willing to sort of get over that in order to help friends in danger. Ellie I love because she’s pretty indomitable throughout. There are situations that scare her, but without her, Kai wouldn’t really make it, and I love her for her stability and loyalty. I wrote Kai for my son, who was seven months old when I started writing. He’s sort of the embodiment of some of my favorite pre-teen boys of my acquaintance. Ellie I met one day, only her name wasn’t Ellie. But I met this 12-year-old girl with unruly blond hair and her nose stuck in a book, and she became Ellie in my head. She’s also an embodiment in many ways of a couple of other girls I know, my goddaughters come to mind as major influences for her. What kind of research did writing Flight of Blue require? Did you find any weird facts? I mainly researched Possums actually to bring my marsupial friends to life. They have opposable thumbs on their back feet, so little tidbits like that helped me know not to put shoes on them. We have a boxer, who while older than Sebastian in the story, is pretty much the inspiration for Seb, so I didn’t have to do a lot of research there. I just pictured our dog, Otto’s, reactions to events. Which books and/or authors have been some of your biggest influences first as a reader then as a writer? I like to credit Madeleine L’Engle, J.R.R. Tolkien, Susan Cooper, Lloyd Alexander, C.S. Lewis, J.K. Rowling, and Rick Riordan as all being amazing writers of children’s and young adult’s fantasy that I have read and re-read many times. What was the most difficult part of writing Flight of Blue? Sebastian (the boxer dog) was actually the hardest because it was hard writing a character who doesn't use words. But in the end, it was definitely worth the struggle to record all of his reactions throughout the scenes. He, however, got quite huffy with me at times over my omission of his responses and I was forced to go back. Is there anything in particular that you would like your readers to take away from Flight of Blue? Finally, do you have any upcoming projects that we can start looking forward to reading in the future? I’m right about 50% of the way through the first draft of The Guardians, the sequel to Flight of Blue, and the second book of the Keeper of the Keys Chronicles, which will be a trilogy. The Guardians will be out in 2013, and you can look for the final book in 2014. Once upon a time there was a little girl who read a book and thought, one day, I’ll find another world. Many years later, after a near death experience at a traffic light, she passed a possum dying on the side of the road. She stopped, and with its dying breaths, the possum imparted a tale so wondrously strange, she drove home realizing the new world she’d been searching for was right there all along. So she embarked on a quest of mythic proportions, traveled far and wide to the farthest corners of this world to uncover its secrets. Now she’s bringing the story to you. Between chasing chickens off the porch and raising her son, A.E. Howard tells tales of the three Realms, and the boy who changed it all. You can keep up with A.E. 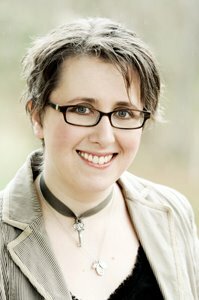 on her Author Page, Twitter, Facebook, and Goodreads! 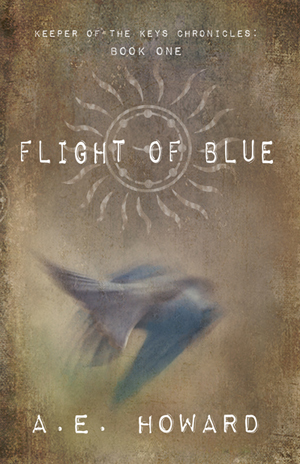 Don't forget to stop by the Blog Tour Giveaway for Flight of Blue!